The surface of Ceres, imaged by the Dawn space probe. We usually associate volcanoes with extreme heat. But new results demonstrate that the Solar System’s largest asteroid, Ceres, is covered in volcanoes that have spewed ice throughout their history. Scientists analyzed images of Ceres, a rock 588 miles wide (Montana is 630 miles wide) and the largest asteroid in the asteroid belt, taken by NASA’s Dawn spacecraft. They found that Ceres is covered in ice volcanoes, and estimated that a new one probably appeared every 50 million years in the rock’s history. The research demonstrates that Ceres is an important body for studying ice volcanoes in general, since other celestial bodies in the outer Solar System, like Europa, Titan, and even Pluto, might have ice volcanoes, too. “Ceres is the only plausibly cryovolcanic world to be orbited by a spacecraft up to now,” the team of American scientists write in the paper, published today in Nature Astronomy. Cryovolcanoes are planetary features that spit out ice (or icy material) from the depths of a celestial body—imagine Earth’s volcanoes, but replace the lava with ice. NASA’s Dawn probe, which orbits Ceres, first identified a large mountain on the asteroid’s surface called Ahuna Mons back in 2015, and scientists interpreted the feature as an ice volcano. The researchers behind the new study looked through images taken by Dawn’s Framing Camera and searched for dome-shaped features larger than 10 kilometers (6.2 miles) in diameter, a signature of cryovolcanic activity. They were able to take reliable measurements of 22, and even found one the same size, though wider and shorter, as Ahuna Mons. Their computer modeling, based on past data, demonstrated that these domes were around 50 percent ice by volume. 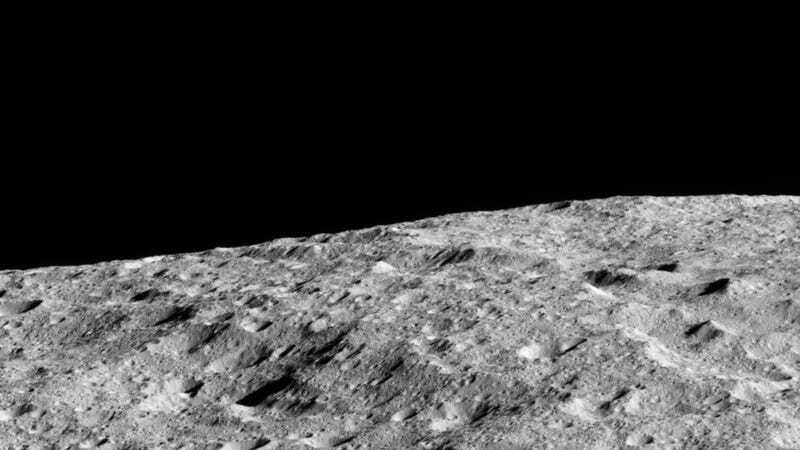 Their analysis, based on the ice content and size of these domes, revealed that they were hundreds of millions of years old, and that a new dome forms on Ceres every 50 million years, on average. They estimated that the asteroid spits out around 10 thousand cubic meters per year of ice—about as much as could fill one and half Goodyear blimps. They conclude that these ice volcanoes are not as important to the structure of Ceres as lava-spouting volcanoes are to shaping the Earth. But they are still important—as we’ve pointed out in the past, they may be contributing to the erasure of Ceres’ craters. A paper like this has plenty of limitations, as the scientists point out. They can’t guarantee that every dome they measured is really an ice volcano—and there are probably non-dome-shaped cryovolcanic features, like volcanic upwelling after impacts. Nor can they identify whether the amount of activity has increased or decreased over time. Still, they write, other places in the Solar System, like Jupiter’s moon Europa, have ice volcanoes that could eject far more ice and serve a more important role. The Dawn mission is coming to an end, but since it launched in 2007, it has taught us much about the asteroid belt and has illuminated some of the many mysteries of Ceres. Perhaps hiding among its data are even more secrets about the ice volcanoes of this giant asteroid.